There are few people whose hobbies and way of making a living are one in the same. Most people are just working for the weekend. Few get to enjoy every day like it’s Saturday. Corry Weller is one of those lucky souls. She began racing quads in 2001, followed by short-course UTV racing in 2007. In 2010 she became the winningest female in short-course history and won the Lucas Oil Off Road Racing Series SR1 Championship in 2011. 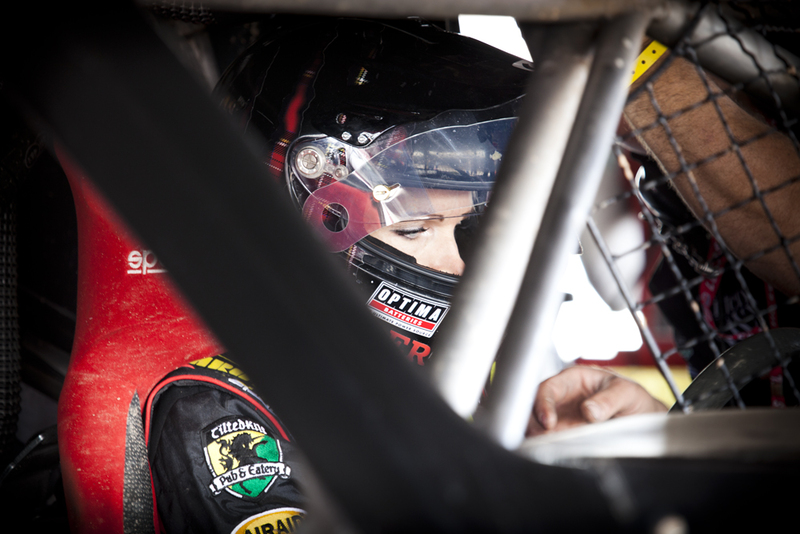 In 2012 she added Pro 4 truck racing to her repertoire and again, has been very successful. We recently caught up to the incredibly friendly champion between races. WATV: What ATVs or UTVs do you own? CW: Right now I own a 2009 Yamaha YFZ450R and a Yamaha SR1 race Rhino (a custom race Rhino with an R1 streetbike motor in it that I race when I’m not racing my truck!) Yamaha actually just came on board as a sponsor, so it looks like I will also be getting a brand new Yamaha Viking to use as a pit vehicle! WATV: Where is your favorite recreational place to ride? CW: That’s easy! I am a dune girl…..I love the dunes at Glamis in CA. When race season is over, dune season begins, so it’s a great way to spend my off-season! WATV: What are your hobbies outside of motorsports? CW: Oh wow….I don’t really have any!! Pretty much everything I do involves motorsports. I do like Crossfit, if you can call that a hobby? I do that to stay in shape for racing……and I love to read when I have the time. It helps me de-stress. WATV: What was your last traffic ticket? CW: Oooo….that’s a tough one. I used to get a lot of speeding tickets when I was in college, until I calmed down a bit after I had kids. I think it was for turning right on an off-ramp, when there was a sign I couldn’t see that said “no right turn on red”. The officer and I chatted about racing for about 20 minutes that day…..
WATV: How did you get into motorsports? CW: On a whim, actually. I never raced anything growing up…..in 2001 I decided I wanted to learn to race MX, so I bought a quad and found a track here that allowed quads, and started riding. I was hooked instantly, and have been racing ever since that day! WATV: Describe a typical day in the life of Corry Weller. CW: Oh, well….it’s not really glamorous. I wake up around 5:30am, go to Crossfit, eat a quick breakfast and spend some time on my computer catching up on e-mails, paying bills, reconciling my sponsor account, social media, etc. Then I head to the shop and order parts, work on the truck, etc. I do alot of parts running, too….seems I’m always driving around picking up parts that we need for whatever we are working on that day. Usually we are at the shop till around 7 or 8, but some days I get to go get my nails done, or do some non-work related stuff, but that’s pretty rare. Come home, eat dinner, do some more social media and either read, watch some TV to unwind, or just go to bed. That’s on our non-race weeks/weekends…..those times are MUCH crazier! WATV: What is your must have ATV or UTV accessory? CW: When I buy a quad, the first two things I like to buy are nerf bars and an exhaust. For the UTV it would be intake and exhaust. WATV: When you and your hubby (champion racer Jason Weller) are going somewhere together, who drives? CW: Oh, that’s sort of a sore subject, haha! He likes to drive…..I think it’s a “man thing”, because before I met him I ALWAYS drove everywhere! I am good at driving just about anything, big trucks, motorhomes, towing fifth-wheels, etc…..but if we are going together, he likes to drive. It’s hard for me, because I am sort of a control freak, but I’m getting better at being in the passenger seat. WATV: What is your personal (highway) vehicle? CW: I have a 2012 Chevy Silverado crew cab. Not exactly the best gas mileage, but I need a pickup for all the parts running and race stuff we do. WATV: Most exciting racing experience? WATV: What’s in your music playlist? CW: I have a mix of stuff, actually. Rihanna, Eminem, Skrillex, KillSwitch Engage, Imagine Dragons, alot of current stuff….I like any music that is motivating. I work out with music and sometimes I race/ride with it, too…..so I’m a huge music person. WATV: What is your favorite product at WellerRacing.com? CW: I love our SR1 drive kits. They are made really well, they are super beefy and hold up to alot of abuse. So much of it is billet, and it’s just a really well made kit. Our most popular seller is our Rhino fuel kits, though! Those things sell like crazy!!! WATV: What would your superhero name be? CW: HAHA I have no idea! Something that has to do with speed, I would hope…..
WATV: Your own soapbox, anything you want to say to your fans? CW: Just that I have the best fans ever!! I am not sure if my fans realize how much their support means…..there are days when things don’t go so well, and a fan or two can say the nicest things, and your whole day is so much better!! So, THANK YOU!! Corry, thanks so much for taking time out of your busy race schedule and good luck in the future. To follow Corry check out http://corryweller.com/. This entry was posted in Interview and tagged Corry Weller, racing by charlie. Bookmark the permalink.